One of the most beautiful May blooming flowers is Mertensia virginica or Viginia Bluebells. The pink buds elongate into clear blue tubular flowers that hang amid oversize ovate to round shaped leaves. The leaves often grow to fist size or larger. They are a wildflower native to this area, but according to DNR a threatened species since a 1999 survey. Luckily, because they are so lovely, many nurseries carry Virginia Bluebells, so gardeners can purchase plants. Besides blue, a white and a pink variety are known. According to many horticulturists, the plants are a necessary addition for every garden. After growing them, I agree, but they can need maintenance. They are part of the Boraginaceae, a plant family known for its glaucous, or hairy, leaves and stems. 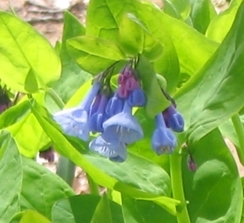 However, Virginia Bluebells are hairless. Their wide, fragile leaves show they are shade-loving plants. A few hours of early morning light or late afternoon light is fine, or just filtered shade. Mertensia also need moist, humus, slightly acid soil. If they like their location, they readily spread and reseed themselves, gradually forming a colony of plants. Once in place, leave them alone as they do not like transplanting. They spread and seed readily, and most likely to right where you don’t particularly want them. The first time I planted them, they died in the middle of the summer. I thought I would have to replace them, but like daffodils, Virginia Bluebells are ephemeral and disappear before summer is over. If you watch, after the foliage yellows but just before the plant dies, you will find little seedpods. Spread the seeds in a spot you would like them to grow. To prevent digging them up after they die back you need to mark where they grew in your garden. To cover the empty space left by their early departure, grow them near plants that will fill the space as they grow, like Hosta or ferns. Annuals can also be interplant among the bluebells while they are growing. Here is what I find interesting about Virginia Bluebells. I could not find one single legend, piece of lore or historical anecdote about them, not even the name Native Americans had for them. They are not used for food, medicine, or dye, and are not poisonous. Although I found one reference the Cherokee might have used them in herbal medicine, I found no corroborative accounts. So here is a plant loved and grown solely for its fleeting beauty.